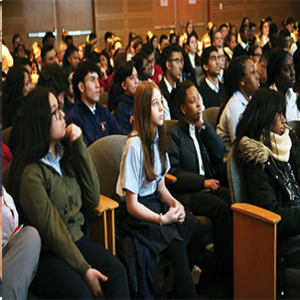 On Friday, March 8, the Archdiocese of New York hosted their 3rd annual Student Leadership Conference at the Sheen Center for Thought and Culture in Manhattan. Seven representatives from Student Council participated in the event focused on engaging in the media with a Catholic lens. These actions actually create media content and contribute to a confirmation culture. “This allows a person to take in the content that confirms or agrees with a belief they already have, [making it] far more difficult to challenge ourselves with different points of view,” Vice President Stella O’Brien declared. For more information or tips on how to responsibly engage with the media, go to http://www.bemediamindful.org to learn more about the Pauline Center for Media Studies. To read the article by Catholic New York which features an interview with Vice President Stella O’Brien, click here: http://cny.org/stories/student-conference-looks-at-how-media-climate-affects-catholics,18783?